The 80's had a-lot of great films, so many in-fact that some were often overlooked and didn't get the attention they deserved. "Night Of The Comet" is one of those films. We are introduced to two bickering teenage sisters, Samantha and Regina, only united by their hatred of their Step-Mother and the event that has unfolded before them. This sets us up for what's to come. I know the film sounds like your typical teen Horror film but it's really not, yes it has aspects of them but it's actually quite cleverly done and it's all down to Writer and Director Thom E. Eberhardt. He creates such a great atmosphere throughout the film, it gets thicker and thicker as the film goes on and the creep factor also ramps up as the film rolls on. He also does a great job mixing genres, with a mixture of Horror, Sci-Fi and comedy he makes them blend into one another with ease and doesn't come off as forced like many others do. Also production designer, John Muto, helped with what he describes as a 'comic book sensibility' for the film. Characters were given specific colours, with the bad guys in blues and greys and the girls in colours. Regina's colours were deeper than Sam's to reflect that Regina was more intellectual than Sam and that Sam was wackier than Regina. It just goes to show that every detail was taken care of. As for the cast, well don't expect to have your heart strings pulled on or be blown away by an Oscar winning performance. What you can expect is decent enough acting that will keep your attention and showcase the personality of each character. They are very one dimensional characters but for this film it works. "Night Of The Comet" is a very fun movie that will be lost on some Horror fans but if you enjoy your 80's films with a bit of humour then I suggest you watch this. As Regina emerges from the movie theatre the morning after the comet, a poster for Death Race 2000 can be seen on the theatre door. Mary Woronov appears in both films. 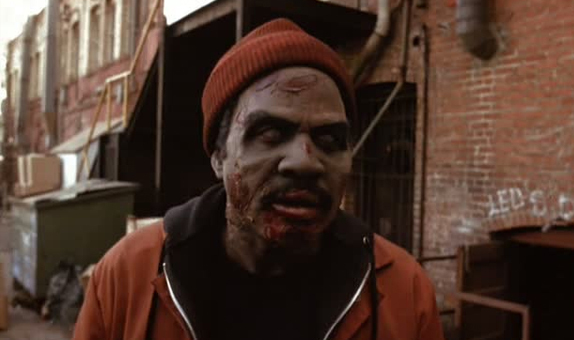 The original working title for the film was "Teenage Mutant Horror Comet Zombies". When cheerleader Kelli Maroney (Samantha Belmont) is playing at the radio station as a disk jockey, she says that she is taking requests from "all you teenage mutant comet zombies". A reference to the working title of the film. The LP that Sam tosses over her shoulder is the soundtrack to "Valley Girl", which would become, for a short time, one of the most sought-after albums of all time. The motorcycle featured is a 1972 650cc Triumph T120 Bonneville. At the start of the movie, Regina is upset because the player "DMK" has upset her perfect list of wins on the video game in the theatre lobby. The car the almost runs over Samantha at the end of the movie is driven by Danny Mason Keener -- "DMK" is his license plate. One of the posters in the projection room of the theatre is for the movie "Red Dust". 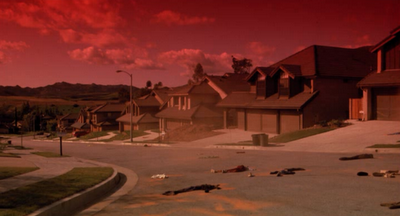 Everyone that was exposed to the comet directly was turned into red dust. The comet passes over on Friday the 13th. When Regina is trying to convince Samantha that everyone is dead she says "It's Saturday, where are all the kids?" so the comet passed on Friday night. In the radio station the recording mentions that there are 11 more shopping days till Christmas. If they count the 24th as the last shopping day that means the comet passed on the 13th.